With festival season officially kicked off, the influx of social posts from festivals across the globe will continue through the fall. For many, festivals are a lifestyle. It’s where all savings and PTO go, and the social channels of these individuals match this output. During each given festival all of the various social feeds are flooded with #festivalfashion and videos of live shows from all the best events, creating the utmost “fomo” in all of us left behind. A recent study conducted by Eventbrite, one of the leading ticketing platforms for concerts and festivals, details the ticket purchasing and social posting habits of festival attendees. The study shows that 1 in 10 people have attended a festival in 2014, with an even higher rate for milllenials at 1 in 5. It also broke down that 75% of the social conversation surrounding festivals is coming from the 17-34 age group who are all super active on social. Fans capture moments at festivals on their phones. 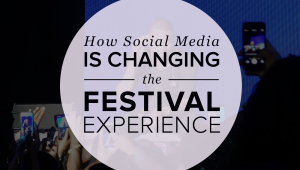 The inclusion of social media in the majority of festivals is changing the way attendees experience the music, the production, and then entire adventure of a festival weekend. Here’s what every festival should be including in their social blueprint this year. The festivals that are the most successful on social media, have a straightforward and intentional social strategy. Promotion of a festival on social is key. It all starts with a simple hashtag that is easy to remember that attendees can pop into an Instagram caption quickly (i.e. #ohmygoshilovebonaroo will probably put users to sleep before they can finish typing). One clear hashtag ensures that all of the social content can be found in the same place, and it keeps the conversation on message across all platforms. Great festivals like Lollapalooza, Governor’s Ball, Sasquatch, and EssenceFest will also include updates about acts or the weather on their social channels, or within their festival app, keeping attendees in-the-know all in one spot. Festivals today are a total sensory experience. 30 years ago a music festival might include a stage, the talent, and lights, whereas festivals and concerts now are massive productions. Complete with multiple stages and various themed zones throughout the grounds all with elaborate stage and lighting designs, festivals have all sorts of great real estate for creating visually stunning social posts, but also for highlighting great social content. With almost all productions including digital components, it’s really easy to weave social displays into the festival architecture. 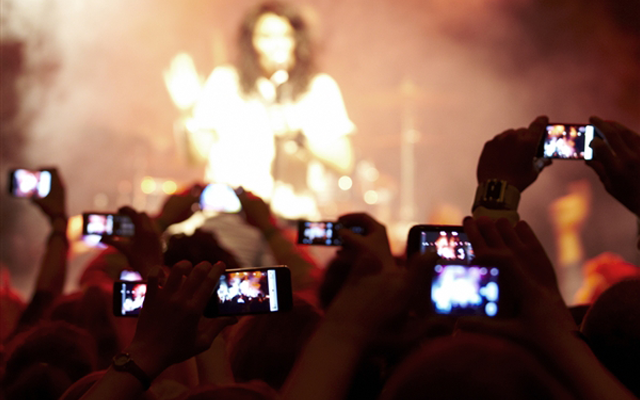 Attend any concert today, and you’ll see attendees with their phones glued to their hands, posting selfies with the band, Instagram-ing the perfect festival outfit, and sending SnapChats of performances to friends back home. By creating a call to action to share posts on social displays within the production, you are playing into a practice that already exists. You won’t have to convince your attendees to participate. Highlighting attendees by making them a part of the production creates an involved community, and puts the fans in the spotlight alongside the talent. Almost every festival has title sponsors and sponsor tents, like Sephora at this year’s Coachella Valley Music and Arts Festival, throughout the festival grounds. Make the most of your marketing spend and get your sponsors to do some of the heavy lifting! Sponsored social visualizations or an online social hub in your festival page or app tie the branded experience together and generate revenue while adding value for both your fans and partner sponsors. 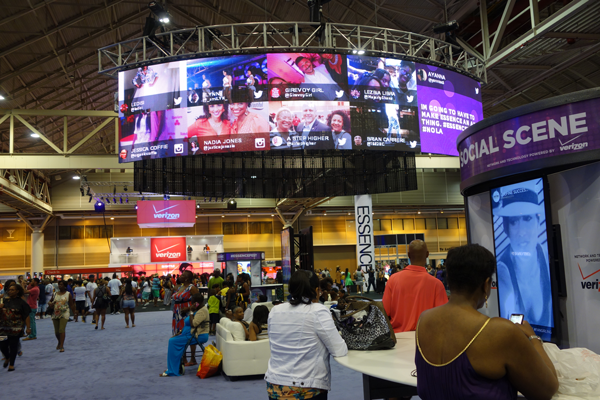 The Verizon sponsored Social Scene at the 2014 Essence Fest. The conversation surrounding a given festival is not limited to the weekend that it takes place. It begins months ahead of time when the line-up is announced or when tickets go on sale, and then continues weeks after the festival with attendees reminiscing and sharing great moments in a Facebook album or #tbt. Creating a social hub where this conversation can all live together is a great way to capture excitement and inspire others to join in. The festival environment is being molded each year by the advances in social media. Incorporating social in new ways creates an original and impressive experience. 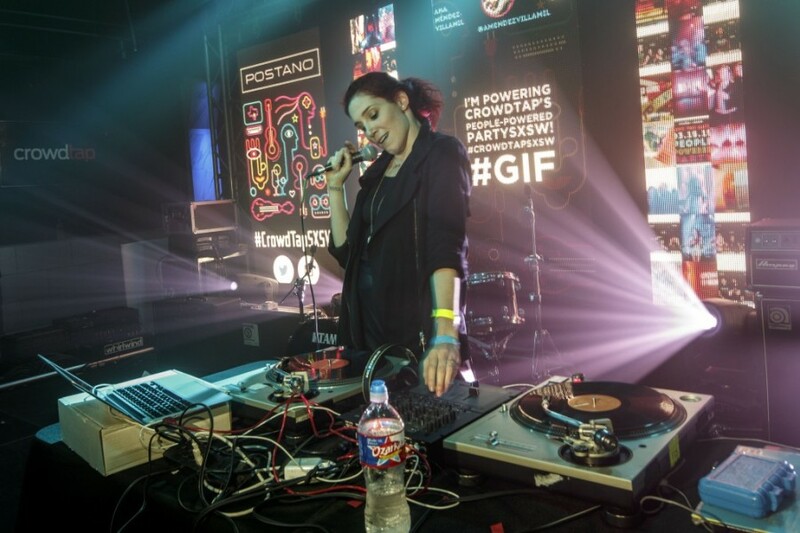 As the 2015 season unfolds, we’re sure to see innovative new social campaigns and in venue activations that augment the total festival experience.